I believe Costa to be among the best positioned farmhouses of the Petrolo winery. The most spectacular views can be enjoyed from it's natural terrace on the Chianti hills at 400 meters asl. The private garden, swimming pool and bedrooms face the Valley of river Arno (Valdarno) overlooking the exclusive Villa of Petrolo. You are welcome to enjoy relaxing days at Petrolo immersed in the total peace provided by the surrounding chestnut woods, olive groves and vineyards. We would love to show you the winery's cellar and give you a taste of our precious wines. Of course you can take advantage of the position of the house for visiting central Tuscany. Florence, Siena and Arezzo are within 50 to 30 minutes drive and are easily connected via train too. You can enjoy lovely treks on the rolling hills surrounding us, bike tours and truffle hunts, natural thermal baths and spa's are within short distance from us. The main fashion outlets are at a short drive from us too. The house has 4 bedrooms and 4 bathrooms ensuite. Fully equipped house with dishwasher and washingmachine. Exclusive garden, swimming pool, bbq and wi-fi. Mainly a self-catering accomodation, on request we can organize chef at home. Ask also for extra cleaning service would you like to have some extra comfort. We will provide bed linen and towels and include final cleaning. You'll get the wood for your bbq and even for the fireplace for free. Reception office is at 500 meters distance from the house, you will always find me or my colleagues during the week ready to assist you during your stay. We wish you a lovely holiday at house Costa, Petrolo winery. Hello, I'm Marco, I manage the holiday houses of the Petrolo Winery. We are a nice bunch of people working all year round on our vineyards, olive trees and properties. I love this place! It dominates with beautiful views the Valdarno valley, in the south-eastern side of the Chianti hills, an area full of charm and history. We're between Florence, Siena and Arezzo, an ideal base for discovering Tuscan renowned history, art, food and our precious wine or just relax soaking-in the natural comfort of our countryside, maybe diving in our swimming pools or getting to the near Thermal Baths. Landmark of the estate is the medieval watchtower of Galatrona while precious renaissance works by Giovanni Della Robbia can be found in the old Parish Church of Galatrona, facing Villa Petrolo. Petrolo owns fine holiday villas set among the green olive groves, active vineyards and beautiful oak woods of the estate. Petrolo is a winery dedicated to the production of Award-Winning Wines and Organic Extra Virgin Olive Oil. And by the way we have a lovely XVIII century rural gentry Villa ideal for events and celebrations or even for big family reunions, Please do send me a message! 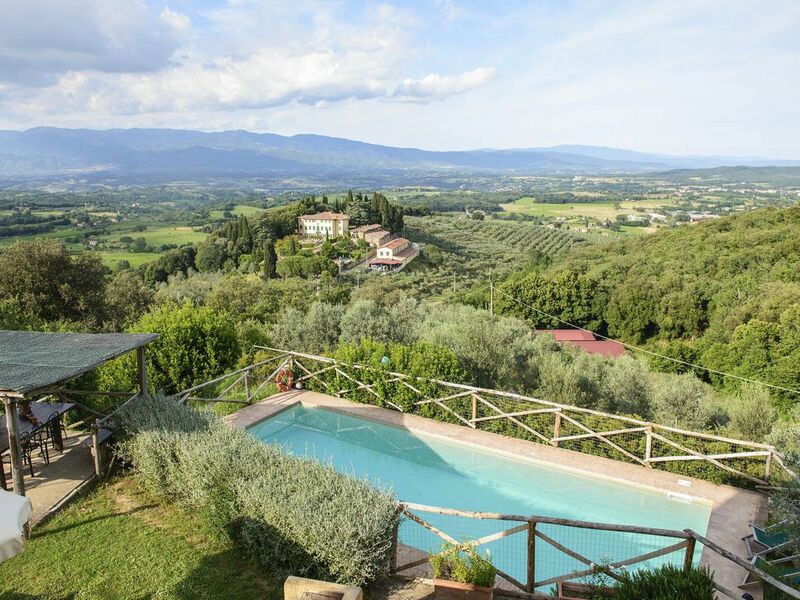 La Costa Farmhouse is placed on a natural terrace overlooking the whole Valdarno Superiore area in the Chianti Colli Aretini with amazing panoramic views. The private pool on the natural terracing and garden surrounding the whole house makes Costa a beautiful spot to relax and enjoy the surroundings of our fine winery 'Petrolo'. You will find the unspoilt natural charm of woods, carefully tended vineyards and Olive groves, art and history will be beside you with the medieval watchtower of Galatrona and the old Parish Church of San Giovanni a Galatrona, with precious renaissance works by Della Robbia. Set among the green olive groves, vineyards and beautiful oak woods, Petrolo is a winery producing fine wines awarded internationally as the Galatrona and the Torrione. Our organic Extra Virgin Olive Oil is also looked after. We will gladly take you to a visit of the estate if you'd like. We're between the key Tuscan historical cities of Florence, Siena and Arezzo. You'll be extremely close to the main attractions Tuscany offers with a short ride either by car or train. The thermal Baths of Rapolano Terme are within half an hour. Easily accessible from us is the fashion outlet from Prada 'Space ' only 5 km from us and also the fashion outlets with the most prestigious brands like Gucci. Tourist Tax. Only 01/04 - 30/09 - Municipal Fee: 1,5 Euro/person per day Max.4 days Heating: CHRISTMAS INCLUDED. LOW SEASON NOT INCLUDED 4€/m3 Towels & linen change (above the weekly one provided): 10 € Extra cleaning:	18,5 €/hour Final Cleanings: included Wi-fi: included CHECK IN: Please advise if you cannot respect this time SATURDAY from 17.00 to 19.30 pm CHECK OUT:SATURDAY before 9 am.